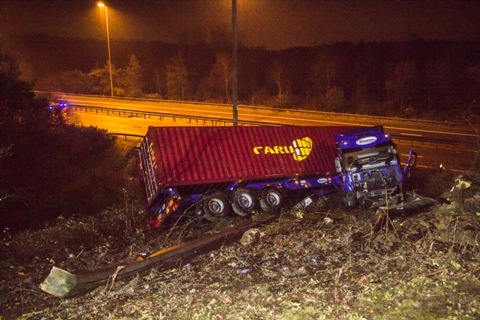 A driver has escaped serious injury after his lorry came off the M3 near Southampton and down an embankment. 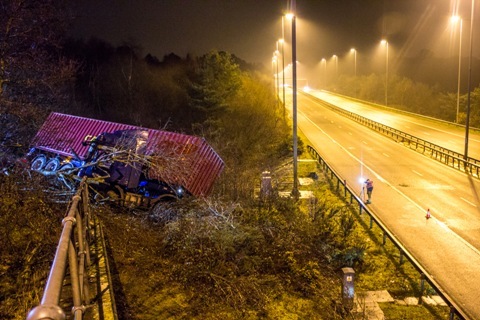 Firefighters freed the lorry driver from his vehicle last night (Wednesday 29 January) after the crash. Crews used cutting tools to release the man, aged 55, from the heavy goods vehicle. He was taken to hospital by South Central Ambulance Service but suffered only minor injuries. The crash happened just after 9.20pm on the link road from the southbound M3 on to the M27. The Eastbound carriageway of the M27 was closed for more than nine hours, until just before 7 o'clock this morning (Thursday 30 January). Drivers had to be diverted onto the Northbound M3.